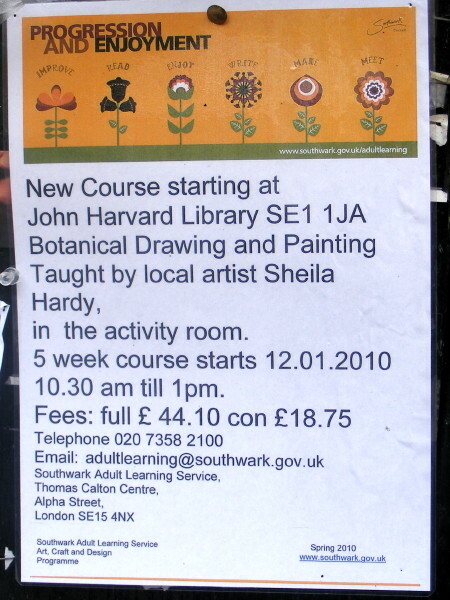 I have been going to the Botanical Art class which has just started in the refurbished library, and would like to spread the word and encourage a few more people to come. Whilst it has been great having near-individual tuition, we are in danger of being discontinued due to low numbers. In spite of my ulterior motive, I would really genuinely recommend the class, which has been a delightful discovery. The next set of sessions is on Tuesday mornings 10.30-1pm. for 5 weeks starting next week Tuesday 23 Feb. It is suitable for any level including beginners (which I am). I have really enjoyed trying out drawing using pencils, charcoal, pastels, pen and ink, and watercolour. The tutor is great, and brings a huge array of various plants and examples for inspiration. It has been my most enjoyable part of the week for the last few weeks, and fabulous to have something just round the corner, and I am sure there must be others who would love it too. How much is the modest fee? I'm very interested. Thanks James. I'm slow to respond these days because of having to use the library for my www. We have now got just enough people for the class to continue (hooray! I would miss it hugely) but there is room for more, so do come along if you fancy giving it a go. Its in the back room in the library, down the corridor where the toilets are. Also, I am told that there may well be a 10-week course after Easter, on a similar basis. Enrollment on the day or more information www.southwark.gov.uk/adultlearning or telephone Thomas Calton Centre on 020 7358 2100.